In her final home match, senior All-American Mikaela Foecke had 16 kills without an error to lead the No. 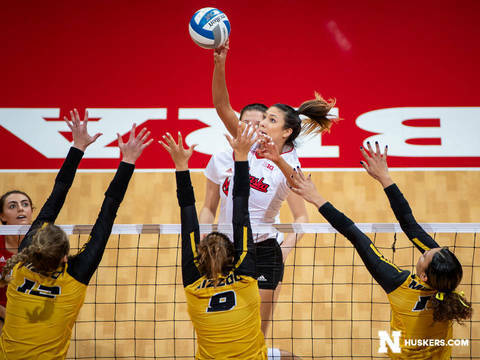 6 Nebraska volleyball team to a 25-14, 25-22, 25-18 sweep of No. 24 Missouri in a second-round NCAA Tournament match in front of a sold-out crowd of 8,382 at the Bob Devaney Sports Center. With the win, Nebraska advances to the NCAA Regional Semifinal, where the Huskers will face No. 10 Kentucky on Friday. Mikaele Foecke’s 16 kills were her most in a home NCAA Tournament match, eclipsing the 13 kills she had in a first-round matchup with New Hampshire in 2016.